The month of October often brings to mind one thing for children: Halloween! One of the best ways to prepare children for the holiday is by making fun, age-appropriate crafts. As they grow, children are constantly developing many important skills including fine and gross motor skills, language development and even cognition. We have provided some links that include Halloween crafts which are not only fun for children, but can sharpen their skills and help you to bond! What will you and your family do for Halloween? 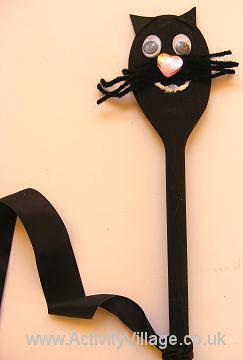 Follow this link for some fun craft ideas like a Wooden Spoon Cat Puppet.